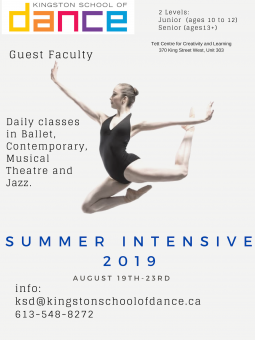 Join us for five days of challenging, energetic, and fun classes where students can meet others who share the same intensity and passion for dance! Interested students may register for either the Junior Intensive (ages 10 to 12) or Senior Intensive (ages13+). Both streams run consecutively in our beautiful waterfront studios at the Tett Centre for Creativity and Learning (370 King St. West, Unit 303) in Kingston, Ontario.